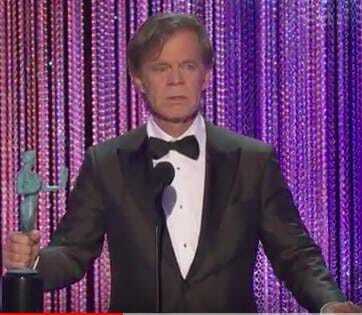 Actor William H. Macy was one of a handful of actors to take a shot at President Trump during his acceptance speech at the Screen Actors Guild Awards last night. The entire event turned into one big Trump bash with actor after actor criticizing the new President who has been in office for a week. the proud single dad of a large brood of smart, spirited, independent kids who without him would be… perhaps better off. A hopeless addict and troublemaker, when Frank isn’t at the bar spending what little money he has, he’s usually passed out on the floor. Frank is constantly scheming on how to beat the system and support his addictions, and he thinks nothing of throwing his kids, or anyone else, under a bus to do so”. What a disgusting comparison! Trump doesn’t even drink and the only ones Trump throws under the bus are Democrats, Anti-Trump Elitists and anti-Americans. And then there was this violent leftist who vowed to punch Trump supporters in the face! What idiots. Hollywood, should stick to acting and their world of make believe!